RIMC EXAM is conducted by RASHTRIYA INDIAN MILITARY COLLEGE (RIMC) on all India basis twice a year for providing admission to boys at RASHTRIYA INDIAN MILITTARY COLLEGE DEHRADUN an inter service institution and a category “A” established by Ministry Of Defense in 1922 with the sole aim of preparing the boys into Defense Service and providing quality education to the young boys. AGE: The admission to the College is bi-annual i.e., in January and July each year. Candidates (boys only) should not be less than 111/2 years of age but must not have attained the age of 13 years on 01 January and 01 July of the term they join. QUALIFICATION: Admissions are made to class I (equivalent to class VIII) only. The candidates should be studying minimum in class VII in a recognized school at the time of admission to the RIMC. They should also be medically fit for entry to the College, in accordance with the MEDICAL STANDARDS PRESCRIBED. Maths and General knowledge Papers may be answered either in Hindi and in English. To qualify, a candidate must obtain a minimum of 50 % Marks in each subject. INTERVIEW :- The oral examination consists of a Viva Voce test of 50 marks, which is designed to assess a candidate’s intelligence, personality and confidence. The Minimum passing marks will be 50%. State NAGALAND gives full fee reimbursement for bills. 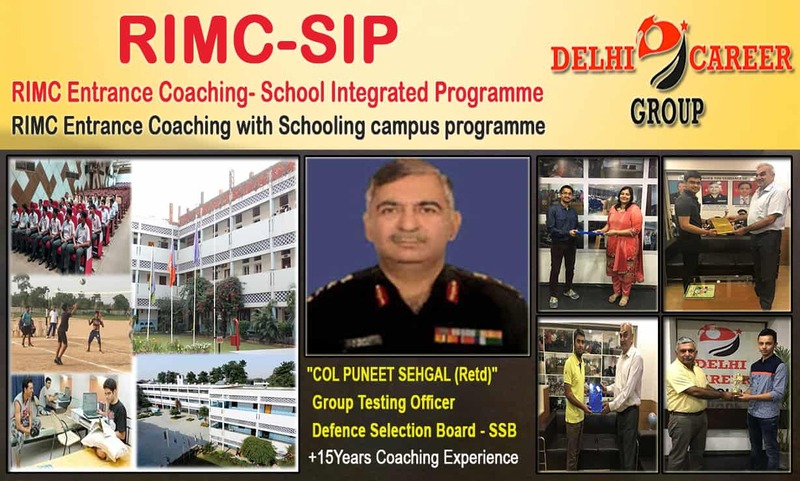 DCC is very well known institute for RIMC COACHING IN INDIA. we also provides Best RIMC STUDY MATERIAL with RIMC LAST YEAR PAPERS. and threw the RIMC ONLINE STUDY. DCC prefer Best RIMC BOOKS for RIMC ENTRANCE TEST. Daily providing doubt sessions for RIMC ENTRANCE COACHING for RIMC PREPARATION. Well experienced,skilled and professional faculty for RIMC ADMISSION TEST.